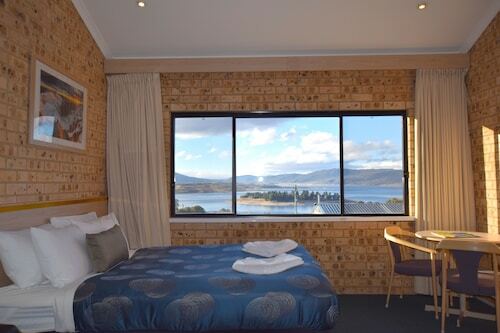 Situated in Jindabyne, this motel is within 1 mi (2 km) of Nuggets Crossing Shopping Centre and Lake Jindabyne. Banjo Patterson Park is 1.1 mi (1.8 km) away. 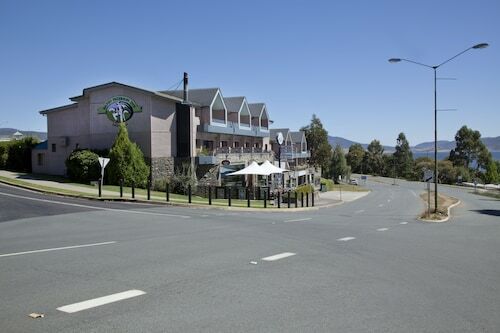 Situated in Jindabyne, this hotel is within a 10-minute walk of Banjo Patterson Park and Lake Jindabyne. Nuggets Crossing Shopping Centre is 0.2 mi (0.3 km) away. Situated on a lake, this motel is within a 5-minute walk of Banjo Patterson Park and Lake Jindabyne. Nuggets Crossing Shopping Centre is 0.4 mi (0.7 km) away. 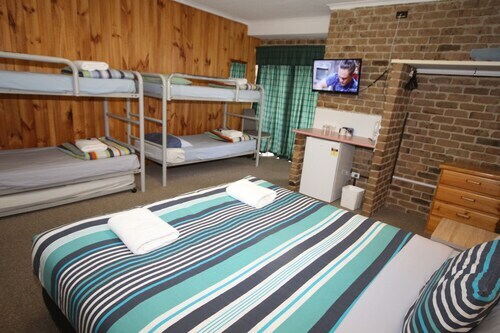 Situated in the mountains, this motel is within 1 mi (2 km) of Nuggets Crossing Shopping Centre and Lake Jindabyne. Banjo Patterson Park is 1.2 mi (1.9 km) away. Situated in a rural location, this motel is within 6 mi (10 km) of Lake Jindabyne, Nuggets Crossing Shopping Centre, and Banjo Patterson Park. Perisher Ski Resort and Coolamatong Golf Club are also within 25 mi (40 km). Wotif you finally took the snow trip you’ve been hanging out for? The gateway to the Snowy Mountains, Jindabyne, is a modern ski destination on the edge of a blissful blue lake. It’s only a stone’s throw away from the snowfields of Perisher and Thredbo, where the pure white of the slopes meets rugged mountain scenery. In summer, Jindabyne is great for fishing, bushwalking, rock climbing and checking out local towns. Like the sound of it? Then book your Jindabyne hotel with us. The Snowy Mountains is Australia’s highest mountain range and the home of legendary Mt Kosciuszko, Australia’s highest peak. The Polish explorer Edmund Strzelecki was the first to climb the mountain, which he named after a Polish patriot. In the following years, stockmen used the area for grazing, which inspired Banjo Patterson’s famous poem ‘The Man from Snowy River’. In the 1960s, the Jindabyne section of the Snowy River was dammed as part of the Snowy Mountains hydroelectric scheme, and the town was relocated to its current location. If you’ve seen the Aussie movies Somersault or (of course) Jindabyne, you’ve already had a glimpse of the wonderful scenery the town boasts. Hire a pair of skis or unleash your awesome snowboard moves at Kosciuszko National Park, 673,524 hectares of natural beauty that’s home to both the Perisher and Thredbo snowfields. Catch the Kosciuszko Express Chairlift to the top of the mountain and save yourself the trouble that Strzelecki went to. It only takes 15 minutes, which is more than worth it for those valley views! In summer, Jindabyne gets warmer but stays a cool place to visit. The Kosciuszko National Park becomes the perfect spot for a sunny bushwalk, or mountain bike ride through forests of lyrebirds and waterfalls. You can also fish in Lake Jindabyne, abseil or go rock climbing at the Ramshead Range, or pay a visit to a small Snowy River town like Berridale, home of the Snowy River Winery. 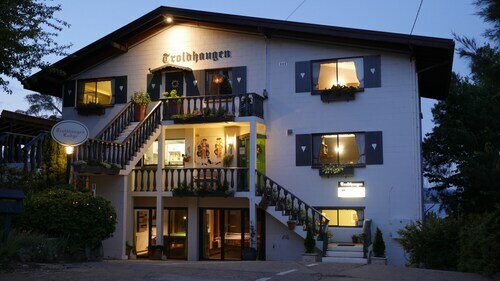 There are small shopping complexes like Nugget’s Crossing in Jindabyne, and you can take your pick from warm and cosy restaurants, humble hot pies, European cuisine or modern Australian delights. There are also some bars and clubs for you to unwind at after a long day in the Kosciuszko National Park. In winter, Banjo Patterson Inn parties hard three nights a week with DJs from Sydney. Jindabyne is two hours from Canberra, so if you’re not planning to drive, book your flight to Canberra with us and simply catch a bus to Jindabyne. You can also hop on a bus straight there from Sydney. 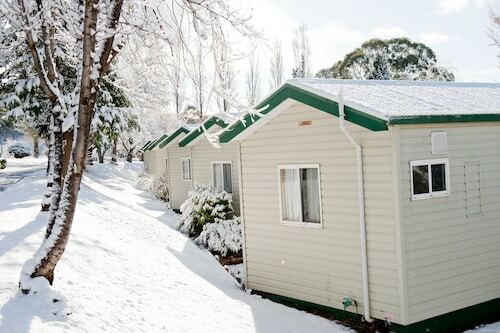 Book your Jindabyne accommodation with us and get your skiing or hiking adventure started. How Much is a Hotel Room in Jindabyne? 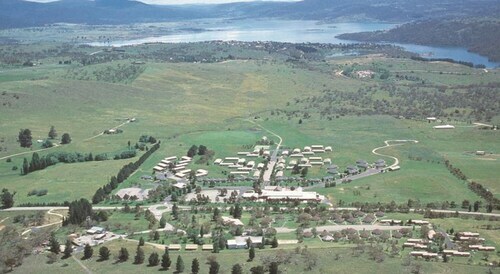 Hotels in Jindabyne start at AU$60 per night. Prices and availability subject to change. Additional terms may apply. Location was perfect. Accomodation was great for self catered holiday. Amenities were good. Close proximity to lake and town centre. Great value for money. Only tiny negative was stained carpet in room.